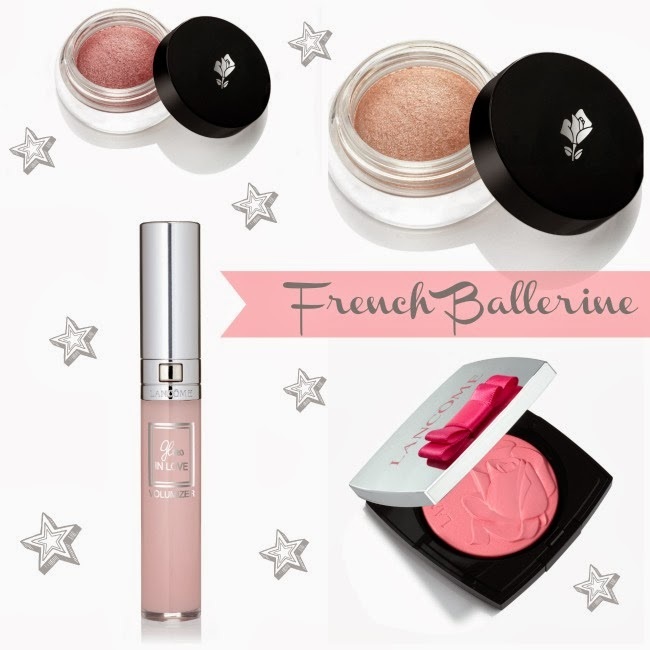 A quick look today at the soft and romantic delights of the Lancôme Spring Beauty Look, French Ballerine. Fronted by actress Lily Collins, this is a small and pretty edit focusing on plumped, glossy lips, radiant cheeks and softly shimmering eyes, in a delicate, barely-there colour palette. Having fallen for the new Hypnose Ultra Dazzling eyeshadows released with the brand’s Christmas collection I was thrilled to receive Topaze Dorée, one of two new shades for spring. This is much more sheer than the intense festive offerings but no less lovely – the delicate, rosy peach tones translate to a sheen of glossy, almost wet-look colour on the eyes. There’s plenty of sparkle, but not too much that I wouldn’t wear it for daytime, as I’m doing in the first pic here. A pretty pink, Spinelle Rose, is also available – both are €27. The highlighter blush in Rose Ballerine (€45) also looks incredibly pretty from the press shots – Lancôme are so, so good at pretty cheek powders and I don’t think this will hang about too long. Other standouts include the sugared almond plumping gloss, €24, and hot pink shade for nails, Vernis in Love Rose Satin, €18. Interestingly, the brand have also introduced a colour-optimising base coat which, applied under polish, intensifies the colour. This is also €18 and I’ll definitely pay it a visit the next time I pass a Lancôme counter. What say you, anything catching your eye? Lovely colours in the eye palette. It looks really beautiful on you! It's very up my street! Nice and easy for everyday too! Hey Emma,this is definitely a very versatile shade! I might have something similar (and more sparkling) from Chanel. I have the pretty blush, and I'm going to give it go today! Its all just so pretty! I'm in love with the packaging! I've had my eye on this collection. Very nice! Lancome is really upping their game. I usually don't use Lancome products, but thanks for sharing anyway!